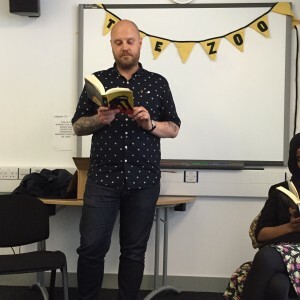 I was lucky enough to attend the Leicester Writes festival of new writing on June 26 to 28, and it was an inspirational experience. In fact, it was so inspirational that it made me feel like having a go at some creative writing myself! But before I get all playful and poetic, here are five lessons from the Friday and Saturday that I want to share with you. Jamie Mollart reads from his novel ‘The Zoo’ at Leicester Writes on Friday 26 June. That word – ‘luck’ – kept coming up again and again. Speakers ranged from writers of adult novels and YA authors to short story writers and those working in TV and radio, but I was amazed by how many of them mentioned luck when they were asked about how they got their own break. That goes with my first point about luck. Don’t get knocked back by rejection because you never know when your own personal lucky break is just around the corner. Mark Newman was a bit down when he didn’t hear anything back from the Bristol Short Story Prize, but the same story went on to be shortlisted for the Costa Short Story Award. Not only that, but it can take a helluva lot of writing before you produce something good. Every writer looks back at their old work with critical eyes because they’ve improved. That’s not a reason to give up. It’s a reason to keep practicing. Do your research – look at the stories and novels that have won before, and read things that the judges have written – but don’t hesitate to enter competitions. Many of them are free, and deadlines can push you to produce new work and get out of old ruts. Also – I refer you back to points 1 and 2; you never know who will read your piece and decide that you are the author for them! Seriously. If you don’t already, just do it. They can help you find a publisher, and a decent agent will provide you with invaluable advice and support. These days they might even help you with some aspects of developmental editing. Publishers receive tens of thousands of manuscripts every year – your chances of standing out from the crowd are tiny. A good agent can get you the ‘in’ you need. Those aren’t the only insights that came from the weekend – stay tuned for next week’s blog on July 8 in which I’ll talk about what I learned from Sunday’s Leicester Writes sessions!